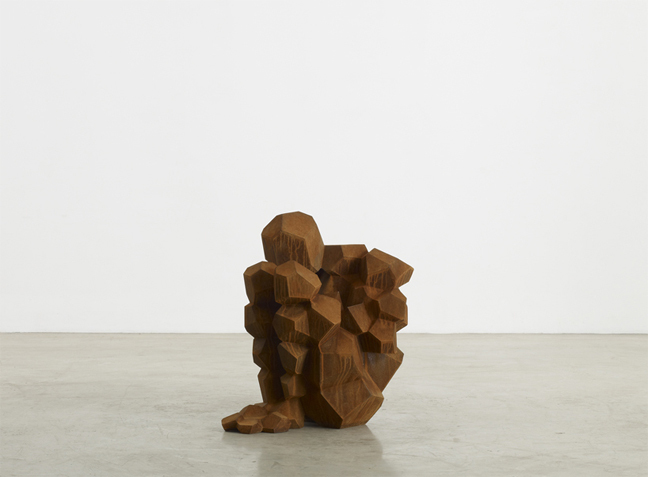 In a career spanning nearly 40 years, Antony Gormley has made sculpture that explores the relation of the human body to space at large, explicitly in large-scale installations like ANOTHER PLACE, DOMAIN FIELD and INSIDE AUSTRALIA and implicitly in works such as CLEARING, BREATHING ROOM and BLIND LIGHT, where the work becomes a frame through which the viewer becomes the viewed. By using his own existence as a test ground, Gormley‘s work transforms a site of subjective experience into one of collective projection. Increasingly, the artist has taken his practice beyond the gallery, engaging the public in active participation, as in CLAY AND THE COLLECTIVE BODY (Helsinki) and the acclaimed ONE & OTHER commission in London’s Trafalgar Square. 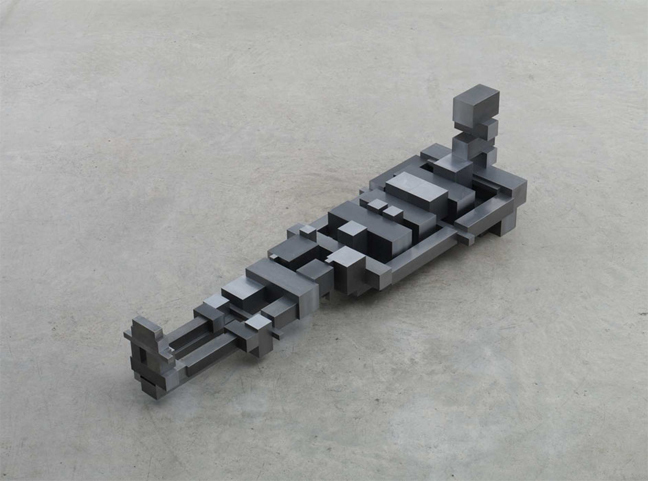 Antony Gormley was born in London in 1950. These twelve works use the same poses cast for the seminal work, CRITICAL MASS (1996). They range from a low crouching position to squatting, sitting, kneeling and standing – a basic syntax of human postures. Depending on its orientation the same posture can convey a variety of emotional states. In this series, the use of rectilinear units refers both to the idea of pixelisation of the human form, but also the rooms and buildings of our architectural habitat. The works put the formal purity of Modernist abstraction to work to evoke human states of mind. Using the language of stacking, propping and cantilevering they produce a somatic sense of containment mirroring that which exists our urban environment. These twelve works use the same poses cast for the seminal work, CRITICAL MASS (1996). They range from a low crouching position to squatting, sitting, kneeling and standing – a basic syntax of human postures. Depending on its orientation the same posture can convey a variety of emotional states. In this series, the use of rectilinear units refers both to the idea of pixelisation of the human form, but also the rooms and buildings of our architectural habitat. The PROPPERS can be traced back to the blockworks of 2001. 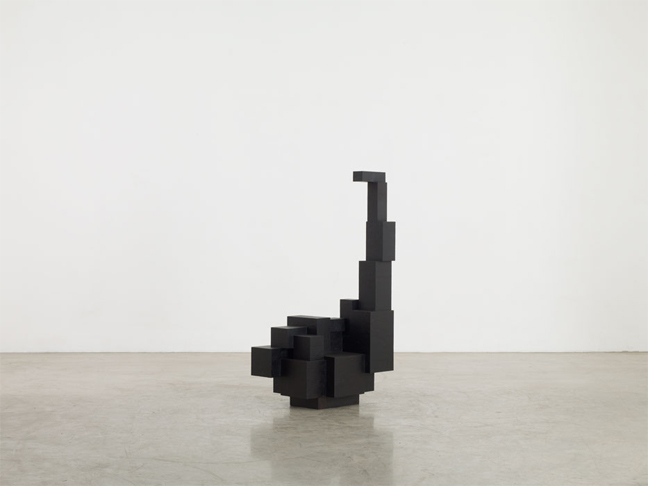 In these sculptures the space displaced by the artist’s body was materialized in ‘physical pixellations‘ made from steel blocks. By 2004 the blocks started to be arranged according to the logic of architectural construction using stacking, propping and cantilever which allowed for a greater dynamic of parts and greater liberty with the body-volumes. As always, the process begins with a moment of lived time: the moulding of the artist’s body, but these new works developed the language of an intermediary series, the Beamers. These are pieces where beams running in three axes, touch the body’s boundary and form an axial stack. ‘Propping‘ developed from trying to achieve the maximum difference of the beam section with the minimum number of elements to make a stack of beams within the bounding condition of a human body.The work uses the tectonics of post and lintel architecture to translate body mass into the equivalent of a high rise tower or cantilevered pontoon, but does so with the freedom of a child seeing how high his wooden blocks can reach.